Now check this out! With the macro lens on my camera, I saw this and got a big fright! They are just eeeeeuuw! What are they? 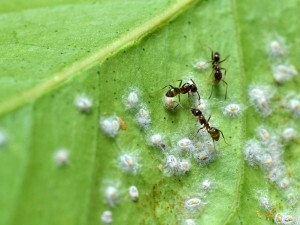 I see that the ants are ‘farming’ hundreds of these little nasties. With the naked eye, it looked like a fungus. They could be aphids but they look like scale. I am not sure. Do you know what this could be? My poor lemon tree is riddled with them. I know I have to get rid of the ants first. They farm aphids and the like and keep the good bugs from getting to them. So, the ant infestation must be dealt with. By the way, we have a big ant problem this year. It has not been this bad in a very long time – a few years, in fact. This week, I need help on establishing what these things are. I’m going to take a leaf sample and check out these little buggers under the microscope. I will try and photograph this – if I can. I want to really see what they look like up close. Hi Eleanor, you are right – we should take the samples to the nursery and let them tell us. I’m going to spray mine this evening with Ludwigs – its supposed to work on aphids and red spider mite. Will take some “before” and then some “after” pics. Thanks for the advice. Hi Eleanor – is this Eleanor Yeld Hutchings?? Thank you so much for this! 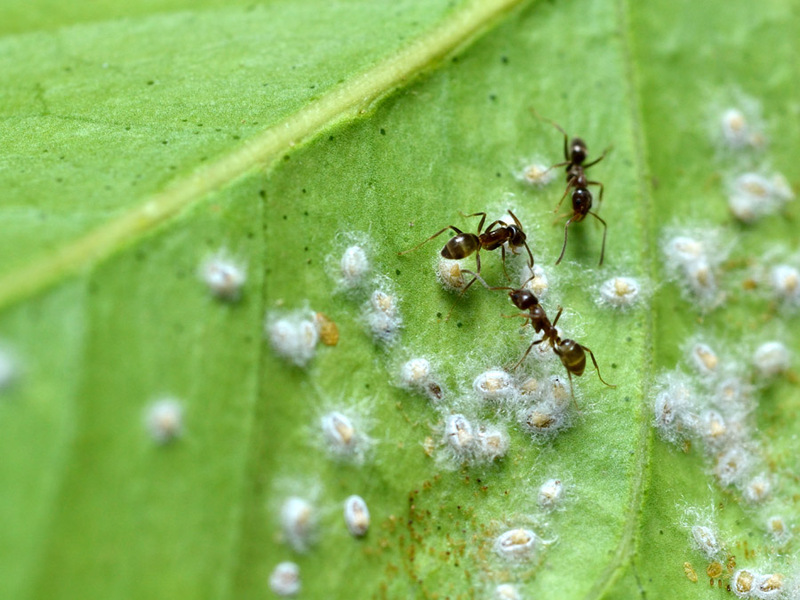 It makes sense that it is scale AND aphids because of the ants – they actually farm them. Ok – I will try the dishwashing liquid spray today! I am trying so hard to get this lemon tree to produce. If I have time this week, I will take a leaf to the nursery. But I have this awesome photograph, so maybe I will try my hand at doing it all online! Find a Plant Doctor who can diagnose it! oh yes, and scale as well! We had both, together, on my “diagnosis” leaf Maybe try taking a leaf in to the nursery and asking them! Both very very common lemon tree pests. Those are woolly aphids, I’m pretty sure. They’re such a pest, and pretty ubiquitous on lemon trees. I took a leaf off my tree that had those on it and took it int to the nursery and they diagnosed woolly aphid. The ants are always associated with it. We spray our tree with a weak mixture of dishwashing liquid and water – enviro friendly – but to be honest our lemon trees are not thriving!!! Oh my! You are right! I found photo’s of the White Fly larvae and it looks the same. But I wonder what the white, hairy, spider-webby stuff is. I so want to nuke these nasties – for good! I am sure they could infect other trees! I think what you have there might be “White fly”. That doesn’t look like aphids to me. My books show that exact thing and say its white fly.